Love this! We have a couple of very utilitarian, collapsible bowls for summer outings with Saffron. 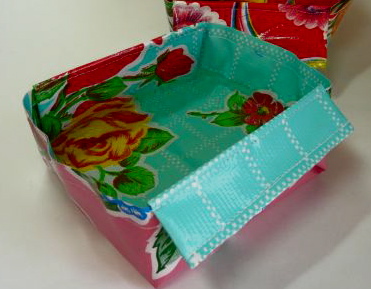 I’d much rather have the stylin’ oilcloth bowl in this great tutorial. It’s made following an origami pattern and then sewn in strategic places. Depending on the patterns you use, these bowls could be really fun. You could even do a faux bois bowl.